Need to eliminate duplicate effort in quote updating your CRM, Excel or Word? Now you can integrate quote/order information automatically to the CRM system. Our clients that use the ACT Hosted Premium are looking for a better solution to easily create quotes and integrate the Quote>Order>Invoice process with their ACT CRM. The ACT solution offers a generic quote development tool that is Microsoft Excel based, but is not customizable to most businesses needs. ACT users are looking for help in obtaining solutions that would help them develop a quoting tool to their specific business needs. How long does it take for your sales team to create a quote in MS Word? 15mins. to a half hour? How many times have they sent the quote out to the customer and with incorrect totals or pricing due to manual updating? QuoteWerks will fill in the contact information in the quote by pulling the contact information from the contact that is currently selected in ACT. You will never have to re-type your customer information. QuoteWerks also allows you to define which fields in ACT should be used for the 'Ship To' contact information. You can setup a separate product database for each vendor that you purchase from and organize the products and services within each database using multiple-level folders. If you already have lists of products and services, you can import them into the QuoteWerks product databases using the QuoteWerks Product Import Wizard. Product descriptions, product image and hyper-link spec sheet can be added for a professional quote that eliminates customer confusions. This provides users with a standard throughout all the integrated systems. 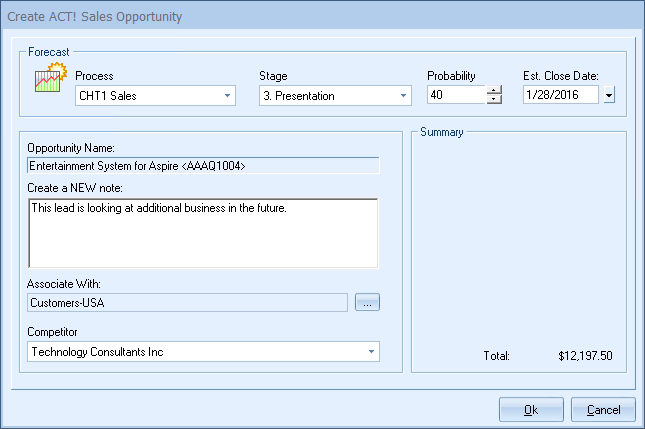 When saving a quote, QuoteWerks automatically creates a Sales/Opportunity under the Sales/Opportunities tab in ACT. When you are in ACT and select the Sales/Opportunities tab, you will see the sales opportunities and their sale amounts for each quote you have created for this ACT contact. 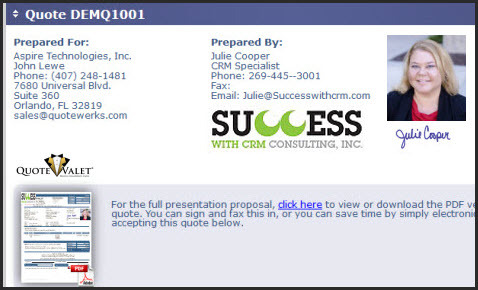 Learn more about QuoteWerks with ACT CRM. We specialize in translating the way you do business so you can take advantage of the capabilities provided by ACT or Infor CRM solutions with an integrated quoting solution. Collaborate with your pilot team members or project manager, to share best practices and design a work flow process for your unique business before rolling out to the end users - increasing user adoption and provide a uniform daily work flow. Educational training and use to maximize productivity by your sales team. If the other CRM and quoting solutions you may be considering are not flexible, not easily adaptable to your business model we need to have a conversation on what can be accomplished.